It’s that time of the year again… and I’m not talking about the holidays. I’m talking about flu season. With cold weather comes the flu and all its friends — body aches, fever, cough, congestion and runny nose. You need to prepare now. If you’re thinking that getting a flu shot will keep you healthy, think again. Each year scientists take a shot in the dark and guess which strains of flu they think will be going around. Some years they make a pretty good guess and the vaccine is about 40-60 percent effective. Even at its best, the numbers aren’t that impressive. And more often than not, they guess wrong and the effectiveness is even lower. In 2004-2005, the flu shot failed 90 percent of the time, and in 2015 it failed 77 percent of the time. Even worse, a new study has shown that the way vaccine manufacturers are making the shot is decreasing its effectiveness even further. The subtype of influenza in this study, called H3N2, is one of several subtypes of flu known to mutate when grown in chicken eggs. The scientists used a high-resolution imaging technique called X-ray crystallography to show that — when grown in eggs — the H3N2 subtype mutates a key protein to better attach to receptors in bird cells. This mutation disrupts the region on the protein that is commonly recognized by our immune system. 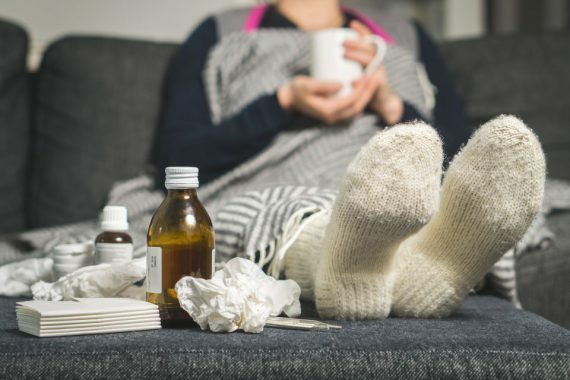 A vaccine containing the mutated version of the protein will not be able to trigger an effective immune response in people, leaving the body without protection against circulating strains of the flu. This means that your first line of defense against the flu is not getting the vaccine. Instead, it’s boosting your own immune system to be able to fight off the viruses you’re exposed to. 1. Avoid sugar and processed foods — You first need to clean up your diet. Sugars and processed foods impair your immune system function so it’s time for them to go. Instead eat whole foods, plenty of vegetables as well as high quality fats and proteins. 2. Optimize your vitamin D — Vitamin D is vital to a healthy immune system. To optimize your levels, get plenty of safe, natural sunlight and take a D3 supplement. 3. Lower your stress — Stress is the enemy of a good immune system. To decrease your stress levels and stay healthy, try meditation, yoga and deep breathing. 4. Exercise — Exercise increases your circulation and boosts your immune system to help you fight off the flu. 5. Get more omega-3s — Omega-3 oils are crucial to a healthy immune system. Take a good quality krill oil daily to help your immune function. 6. Use antioxidants — Antioxidants help prevent damage to your immune system. Pack your plate with plenty of fruits and vegetables and take an antioxidant supplement. 7. Get plenty of rest — If your body is worn out, it’s hard to fight off the flu. Get at least eight hours of sleep each night and be sure to avoid televisions, computers and other back-lit screens in the evening to improve your sleep quality.